The LVI® is packaged into a brief 20 minute survey and a powerful yet compact summary report. A summary of the LVI® results are captured in compact visual profile, making it easy to understand and use. 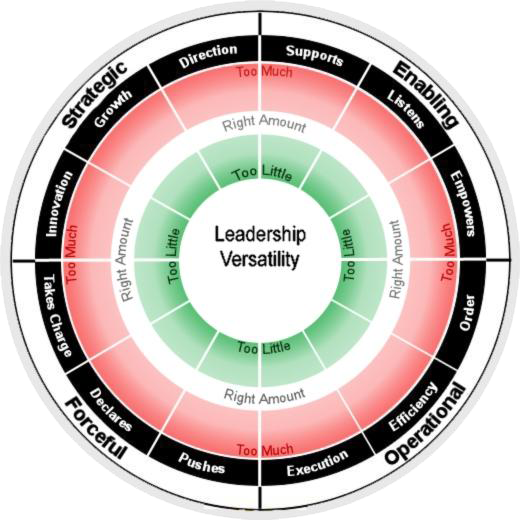 The profile shows scores within the four leadership dimensions: strategic vs. operational and forceful vs. enabling, and their corresponding sub-dimensions. Color zones highlight shortcomings (green - “go” or do more), strengths taken too far (red - “stop” or do less) and true strengths (white). The profile shape is also important: the closer to a circle a profile is, the more well rounded and versatile the leader is. And the versatility percentage provides an overall index of the leader’s versatility: the higher the percentage, the greater the versatility. The majority of leaders score between 70 - 90 percent. For a full description of the LVI® model and example results, see a Sample Report or get in touch.